I have always been a KI Memories fan! When I opened up my package and saw these new goodies, I smiled a little inside! I could not wait to sit down and cut into the papers and play with the new embellishments. My page started with the KI Memories Die Cut background cut page and went from there, adding in punched circles, die cut shapes and sequins to the center of the circles. Loot how cute those sequins are!!! If you love those, you will love the new KI Memories Icicles mini acrylic embellishments. I added some of those along with a die cut piece to this circle. I am back again today to share another fun page, using lots of the new KI Memories Playlist collection. 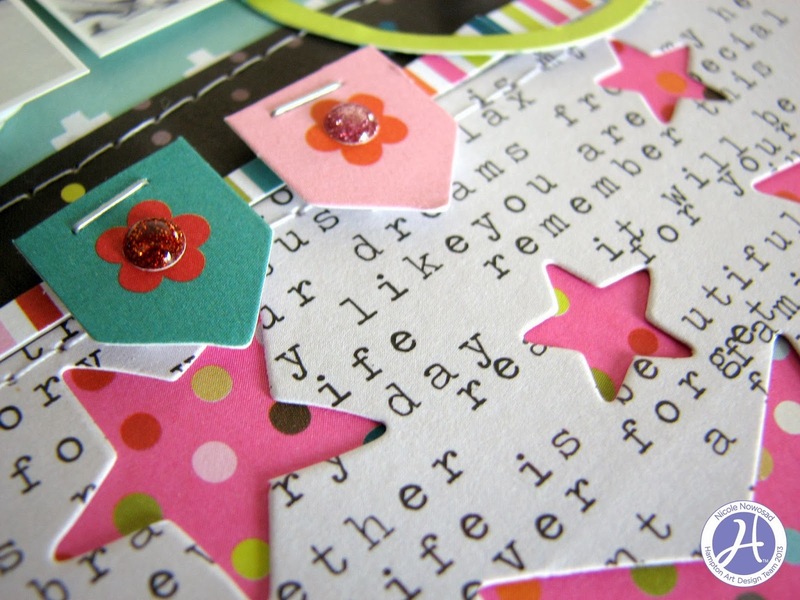 I love the new due cut backgrounds and this time I used the fun star background layered over some of the new papers! I added in lots of the new embellishments - stickers, Icicle icons and glitter dots too! I just love all that sparkle! Trim pink pattern paper ¼ shorter then card base and adhere to card base. 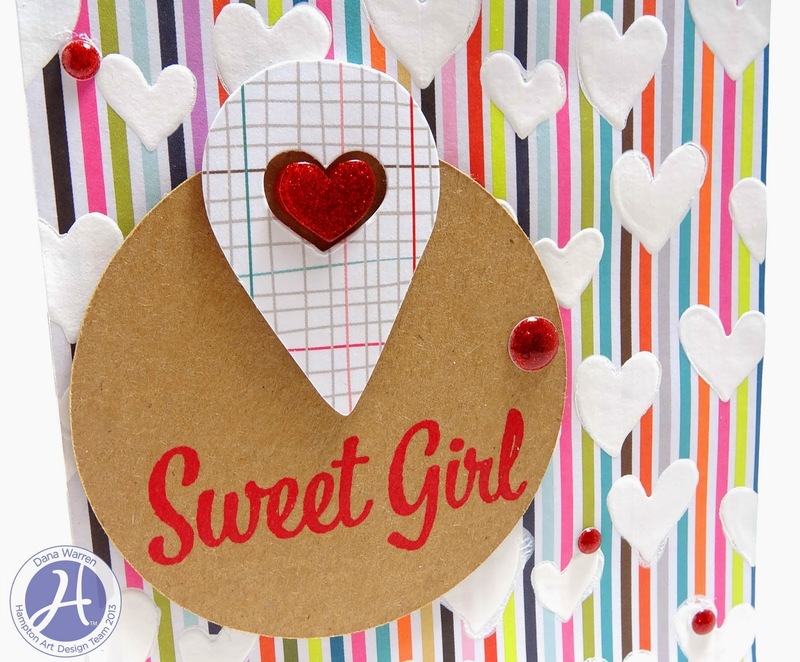 Punch out heart from pink die cut card. Wrap card with twine and tie in a bow. Die cut doilys from pink cardstock, adhere to card base. 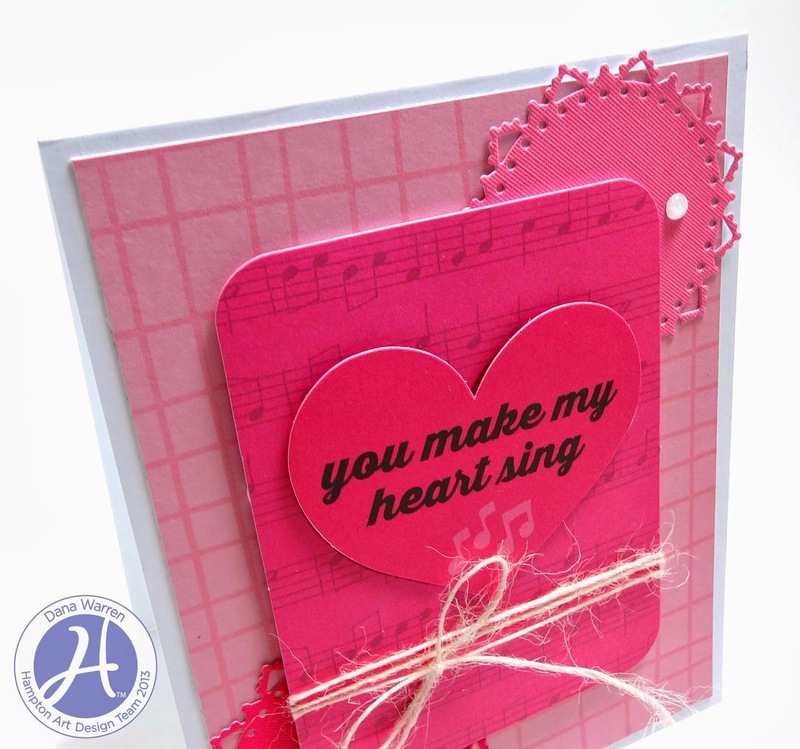 Adhere heart die cut card to card base with foam tape. 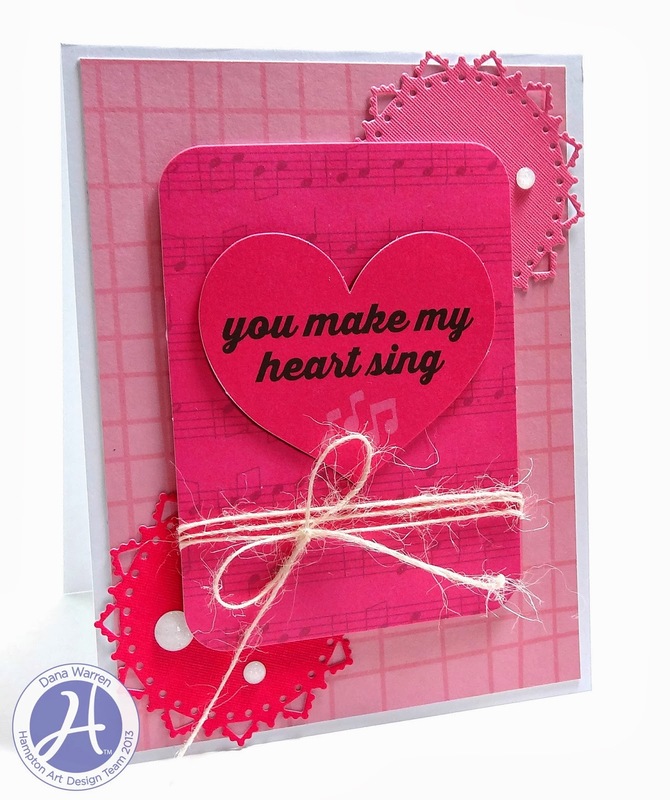 Adhere heart die cut to heart cut out with thicker foam tape. Adhere glitter dots to card base. Hampton Art: KI Memories Playlist Collection – Pattern Paper: Cover Art KI10130. 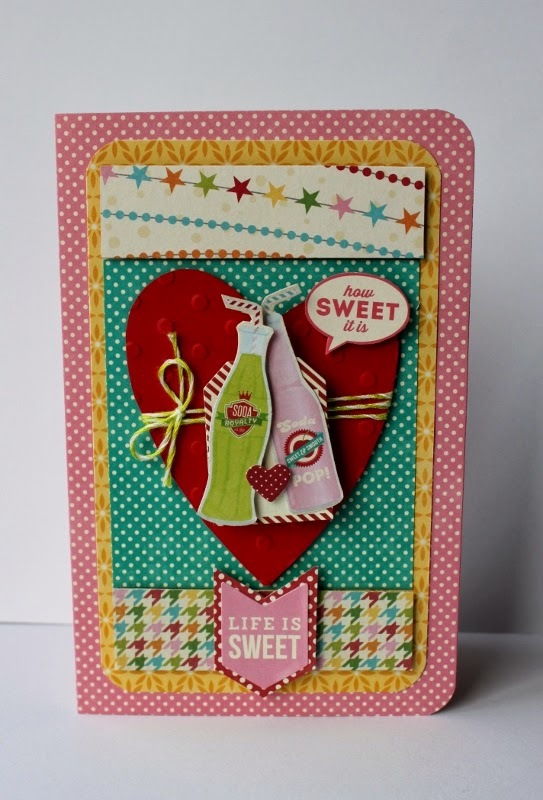 Die Cut Shapes KI1052, Die Cut Cards KI1053, Neutral Glitter Dots KI10148. Trim pattern paper to fit card base. Cut heart cut out paper a little bigger then card base. Place over pattern paper. Spread gesso over hearts, filling in the hearts. Carefully pull up heart paper and set pattern paper aside to dry. 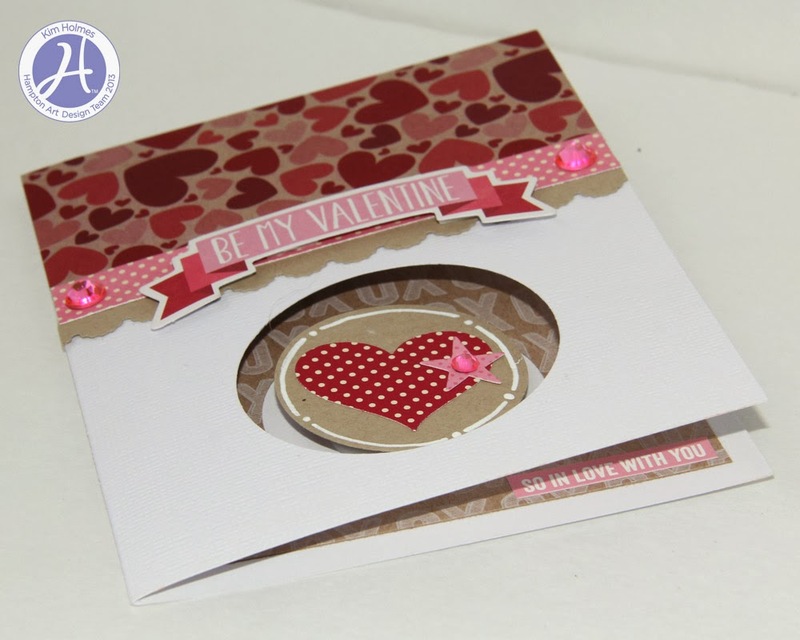 Die cut circle from kraft cardstock and stamp sentiment with red ink. Adhere pattern paper with dried white hearts to card base. Adhere circle with foam tape. Adhere die cut shape to circle. Adhere heart embellishment and glitter dots. 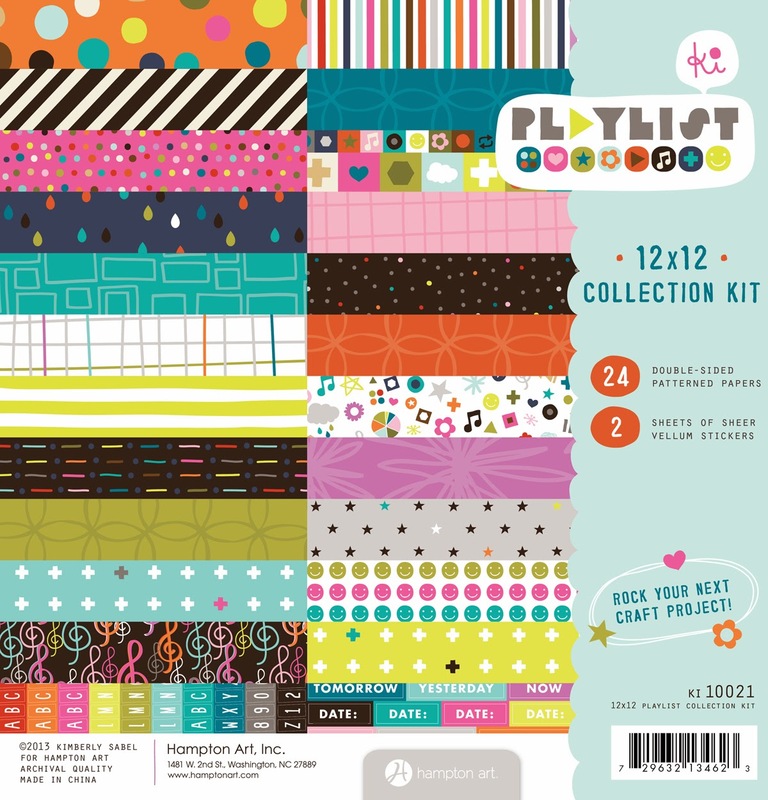 Hampton Art: KI Memories Playlist Collection – Pattern Paper Volume KI10125. Warm Glitter Dots KI10146. Die Cut Shapes KI10152. Red Heart Beat KI10163. Echo Park Stamp – Sweet Girl. Ink: Memento Luxe – Love Letter. Adhere Die Cut Card to card base. Die cut tag from pattern paper. 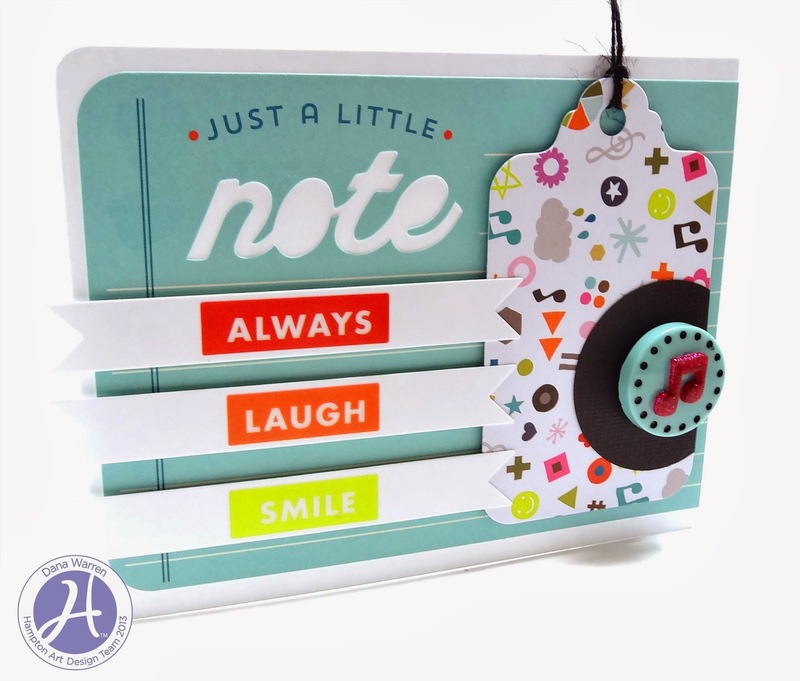 Punch circle from black cardstock and adhere to tag. Adhere embellishment to black circle. Adhere tag to card base with foam tape. Die cut banners, adhere stickers to each one. Adhere banners to card base with foam tape. 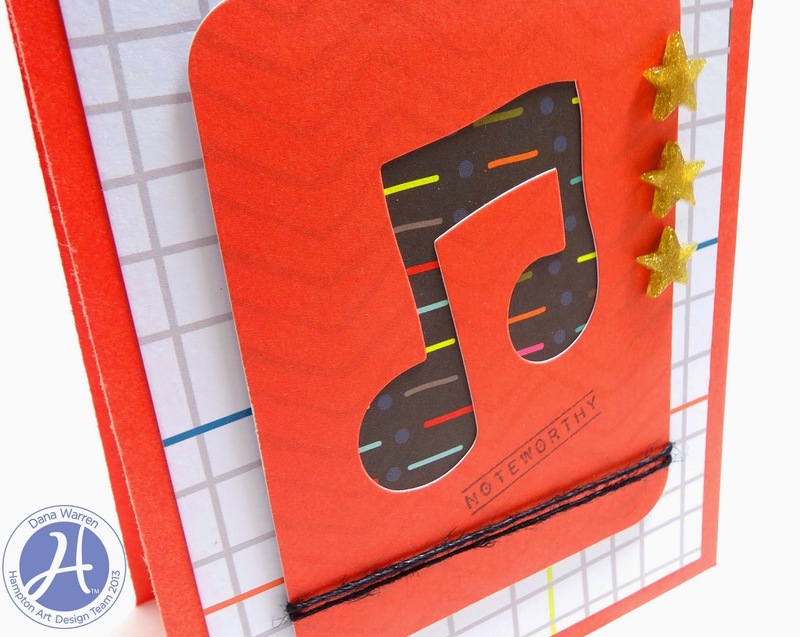 Hampton Art: KI Memories Playlist Collection – Die Cut Cards KI10153. Word Strips KI10145. Pattern Paper Pop Icons KI10128. Icicles Tokens Hers KI10156. Dies: Papertrey Ink – Tag, Banner. Hampton Art has a new line of different tins that were showcased at CHA, earlier this month. There are great mailbox tins in the collection. Kim Holmes, designed these two, fun mailboxes using the Jillibean Soup Read Bean Soup line. Love these! Trim Audience pattern paper to a square a little small then the card base. Adhere elements were the circles are in the Audience pattern paper. Stamp sentiment in one of those circles. 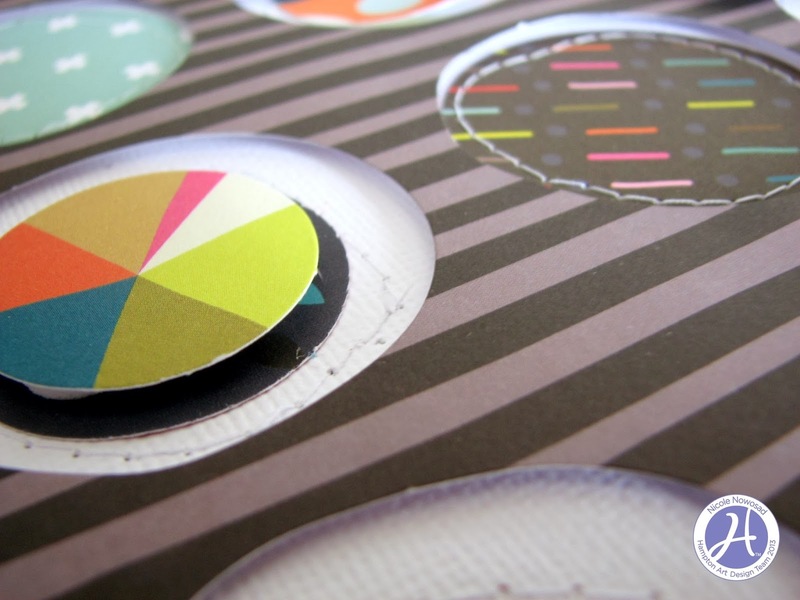 Adhere Audience pattern paper with foam tape. 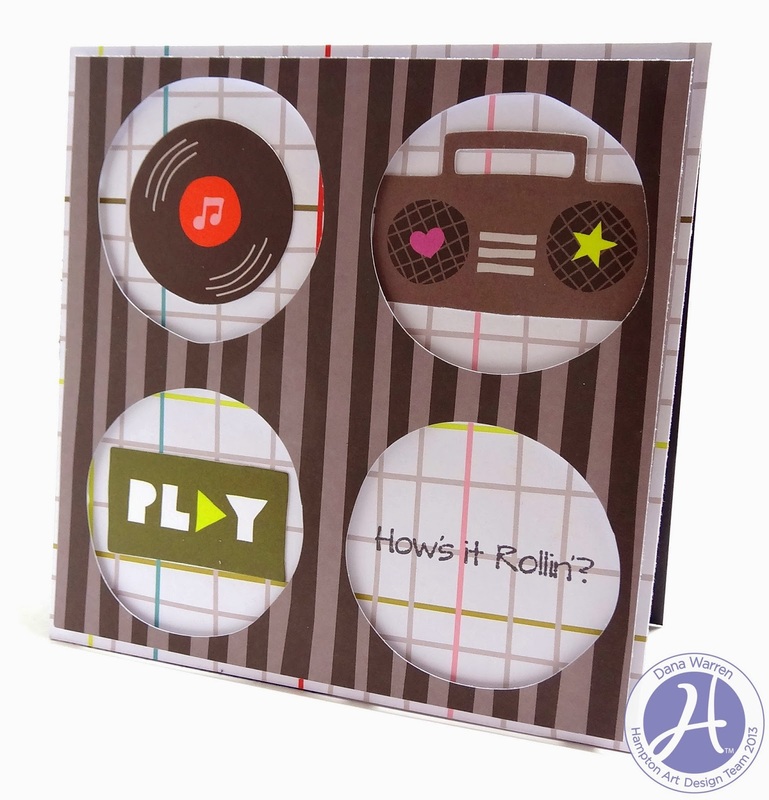 Back Die Cut Card with pattern paper. Wrap twine around card. Stamp sentiment below music note. 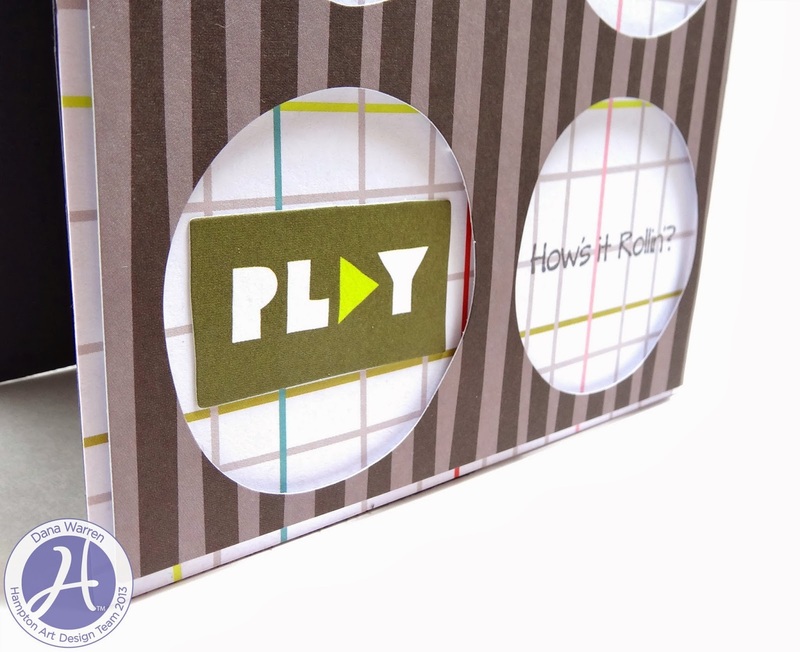 Adhere card with foam tape. Trim pattern paper paper and draw dash lines around edge. Adhere flower embellishments to die cut flower with foam tape. 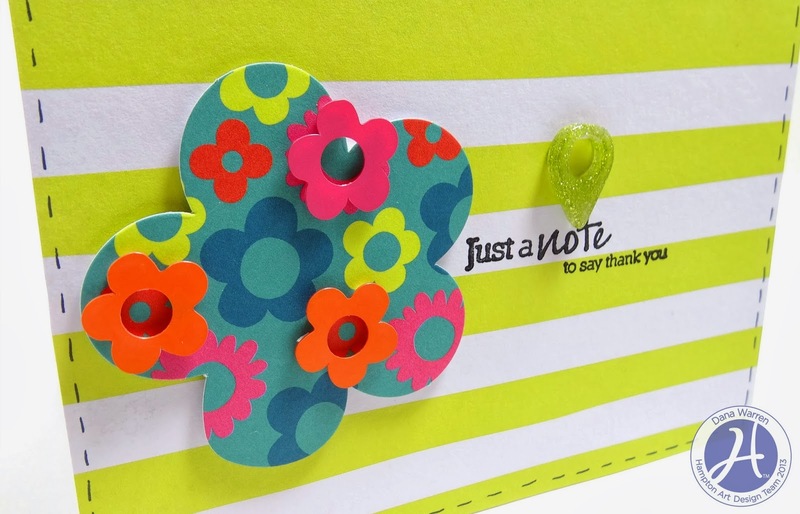 Adhere big flower to card base. Adhere glitter embellishment to cardbase. Today we have more cards that were created using the new Wobbles by Hampton Art. Today's cards were created by design team member Kim Holmes. Today we have 3 cards for you today that feature a new product from Hampton Art called, Wobbles. These add a cool spring and movement to any card project. What little kid wouldn't love to get one of these in the mail?! Here is a favorite card I created for CHA to help introduce the fabulous new Hampton Wobble Action Springs. The card features the brand new Jillibean Soup Birthday Bisque papers and stickers in a rainbow sweet color palette. Then from the Pint of Presents paper I cut out the “How Sweet It Is” message and attached it to the heart as shown with 3D foam dots as well. A small heart in between the bottles finished the tag off. Then I flipped the tag over and added the Action Wobble Spring, not only does it pop item out further than foam dots but it also gives a super fun wobbling jello movement to the card. To finish the card I added the “Life is Sweet” sticker to the Bowl of Bows red polka dot paper and cut out as shown, then added to the card with 3D foam dots. How sweet is that? 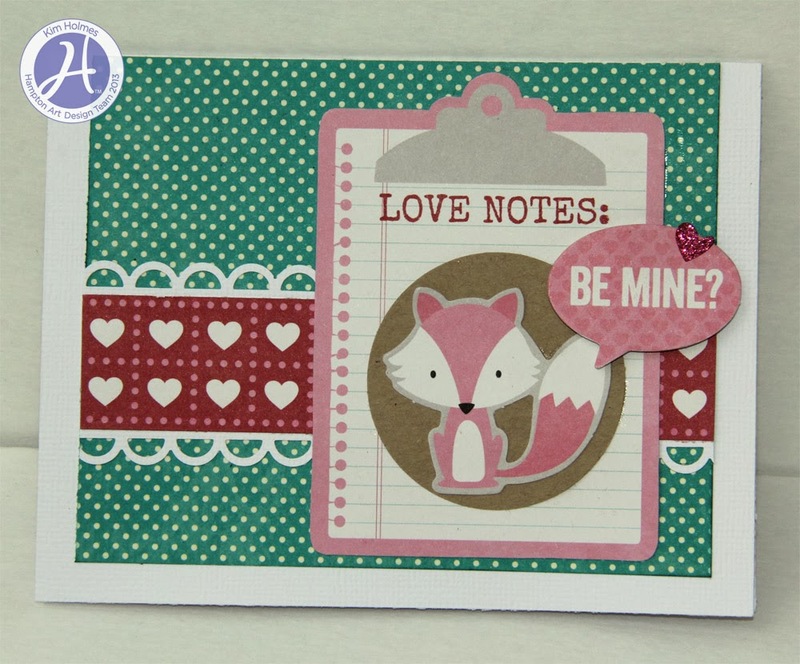 You can have a cute card on hand for a special anniversary or even Valentine’s day! Is there an owl lover in your life that needs encouragement? Here is an adorable card made to share, it was constructed with KI Memories Autumn Flowers 6 x 6 papers, a brand new Jillibean stamp set- You’re Tweet and some Jillibean stampables. Begin by layering the three coordinating KI Memories papers onto the base as shown. Stamp the large owl from the Jillibean Soup/You’re Tweet set in brown ink onto the tan cardstock and fussy cut out. 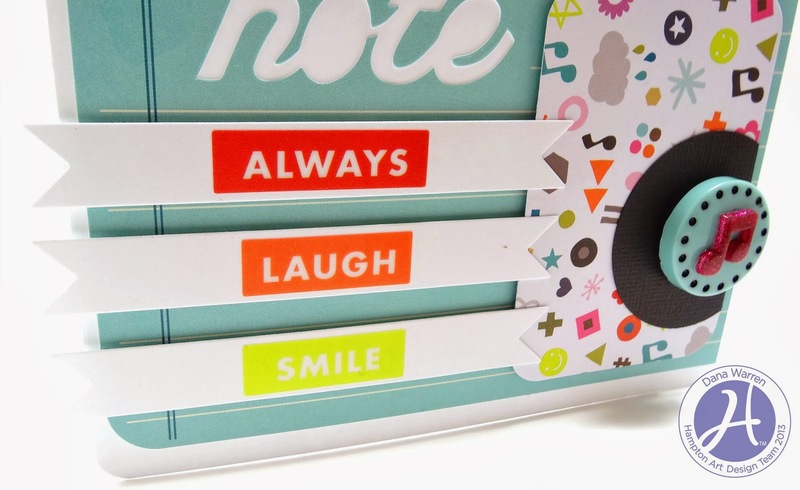 Stamp the “Happier than…” sentiment onto the light blue patterned paper and cut out in ticket stub style using a large hole punch to punch each corner. Then layer the sentiment onto the pink pattern paper with foam dots, finish the sign by adding a mini wood dowel as the sign stick. Attach the sign to card base as shown. 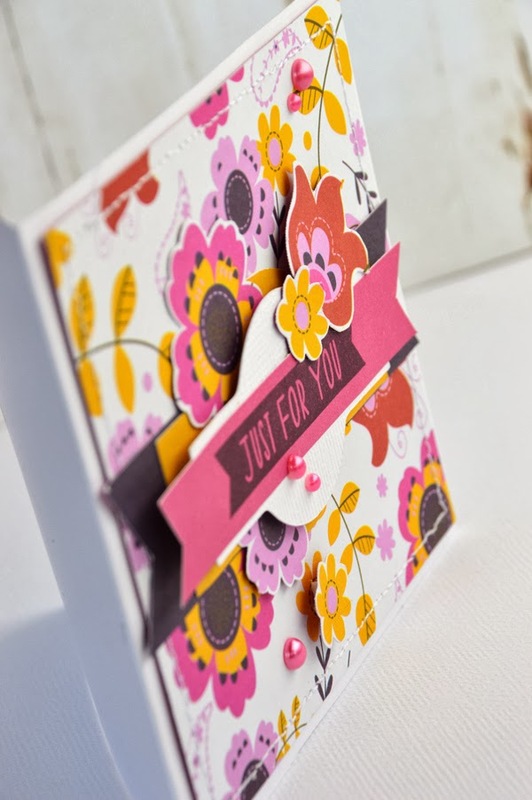 Choose one of the stampable doilies and cut in half to use on card, add coordinating solid paper behind each doily and then attach to card as shown with 3D foam dots. To create the 3D heart balloon, just cut out 3 matching hearts in three different patterns. 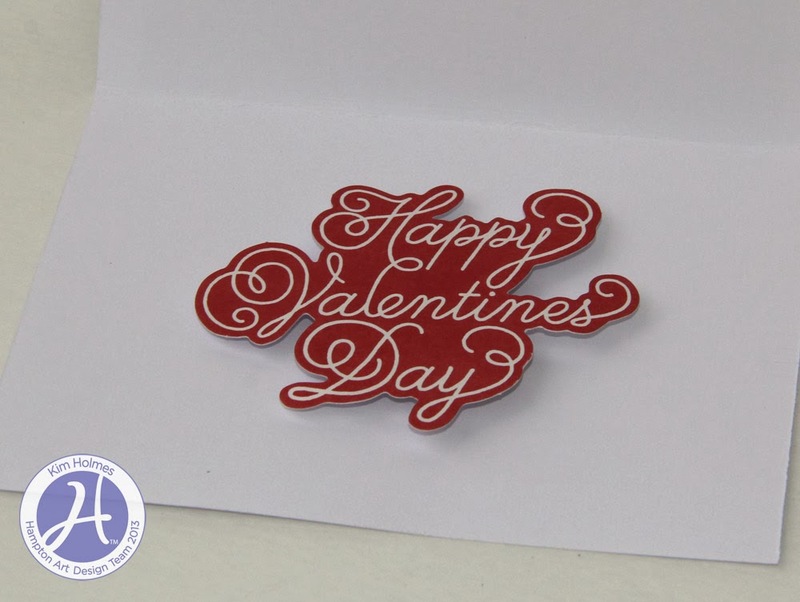 Fold each heart in half and attach together with adhesive then attach to card with adhesive. Using the bakers twine and mini glue dots add the balloons bow and string as shown. Now grab your owl and attach a stampable etched wood button as his belly with glue dots. Then flip the owl over and add the action wobble spring attaching first to the owl then the other end to the card set diagonally as shown. Wrap and attach the bakers twine to the owl using glue dots. 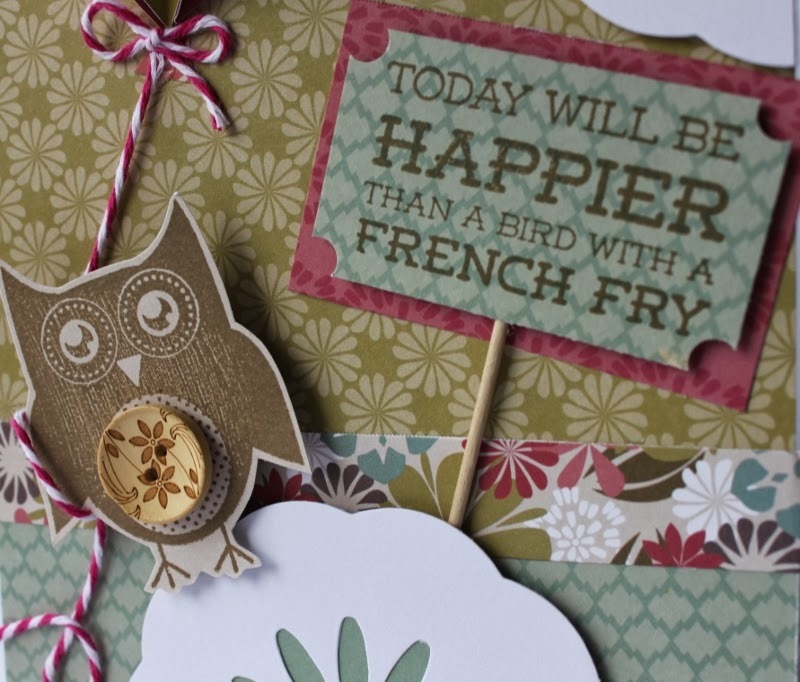 I have decided that today I will be happier than a bird with a French fry, how about you? Begin with Jillibean Soup/Cold Avocado papers in half clove of garlic and chopped green onions to add to card base as background. 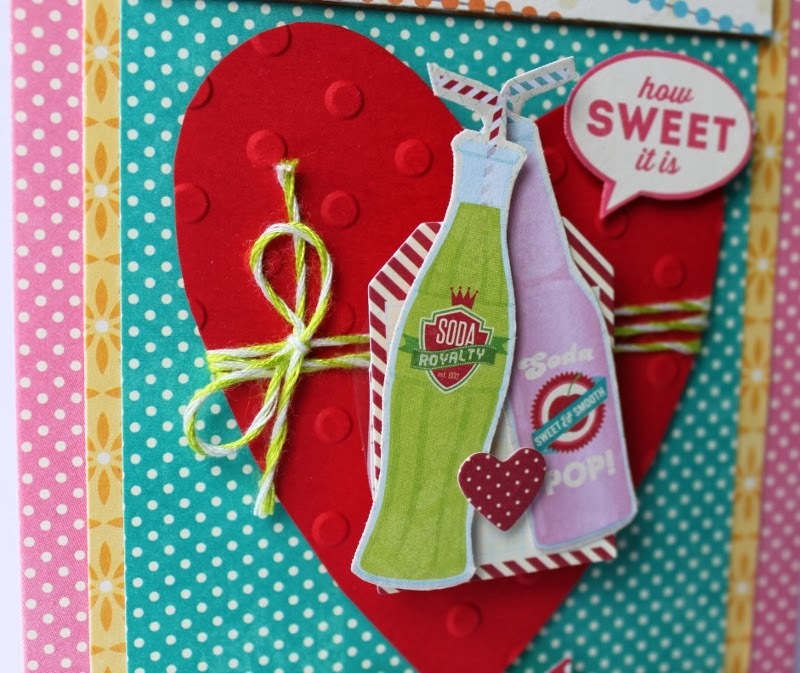 Next, using a corner rounder punch the two outer edges of your card. 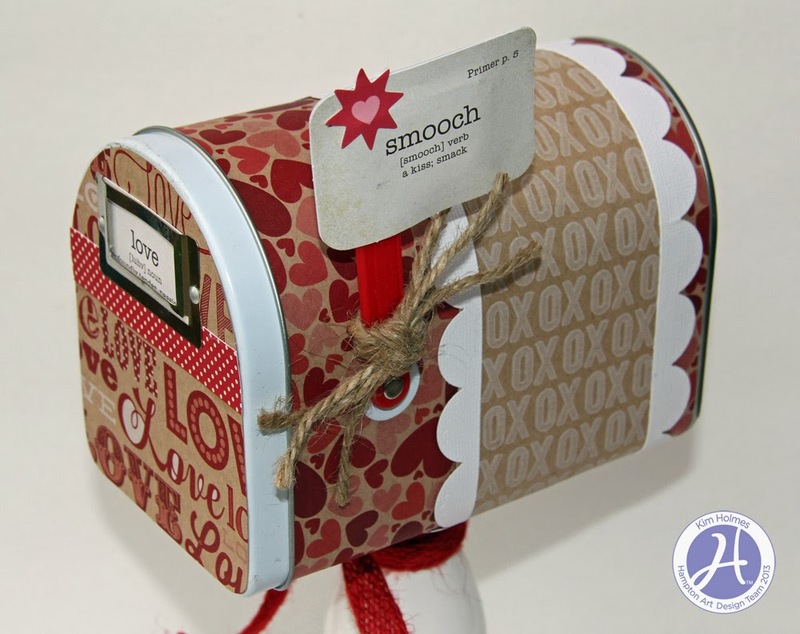 Then layer a stampable wood grain mini bag to the card diagonally as shown attaching with adhesive. Continue the layers by adding the Cold Avocado pea pod frame backed with the pure olive oil paper with adhesive. Then add the other Cold Avocado pea pod pieces as shown with 3D foam dots. 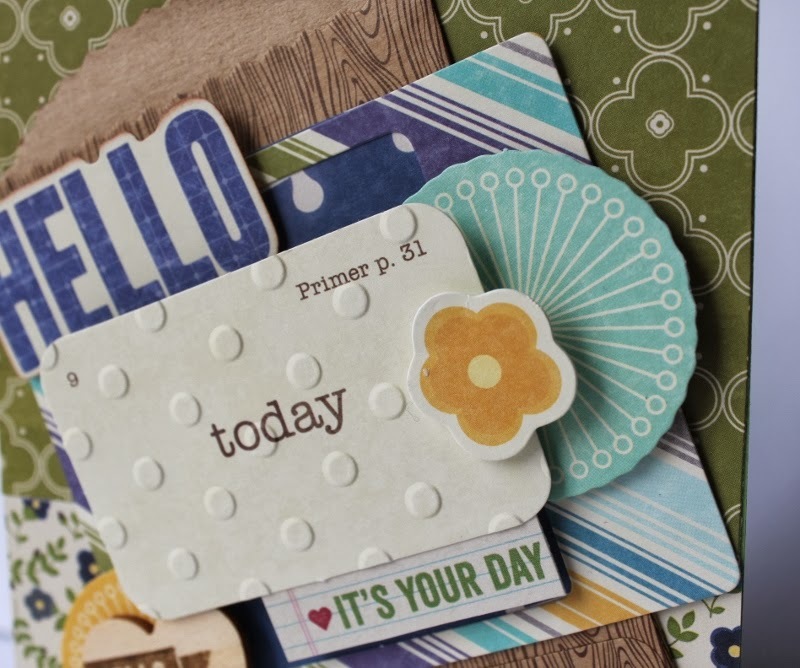 Select a wood heart from your stampable pack and stamp it with the “hello” banner stamp from the Cold Avocado/Better Together stamp set in brown ink and attach with glue dots to the yellow peapod. 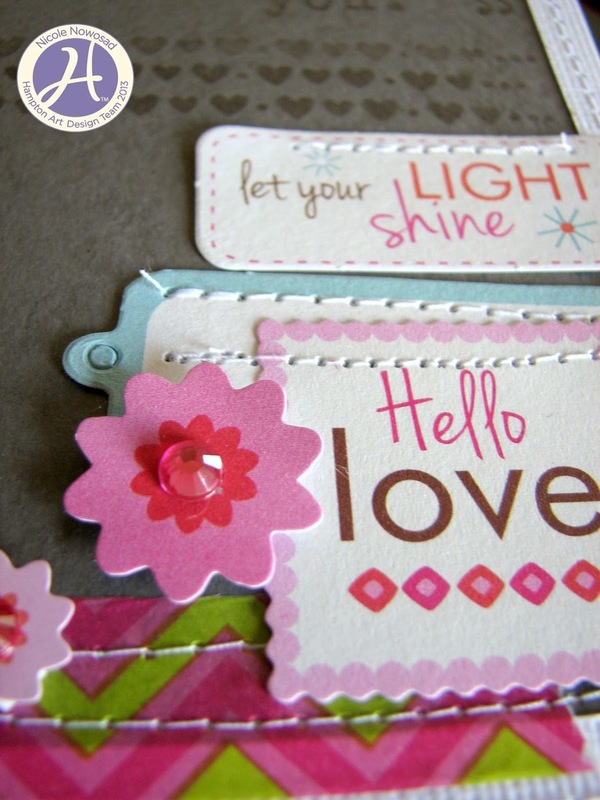 For added texture emboss your flashcard using a polka dot embossing folder like mine from Cuttlebug. From the Birthday Bisque 6 x 6 pad cut out the little bite size bit “It’s your day “ notebook page and attach as a tab to the bottom of the flashcard as shown. Then flip the flashcard over and add the action wobble spring attaching it to the card base as shown. Now you have a fun giftcard holding card for any occasion! other: white cardstock, pearls, machine stitching, foam tape, silhouette portrait. Hi Everyone! 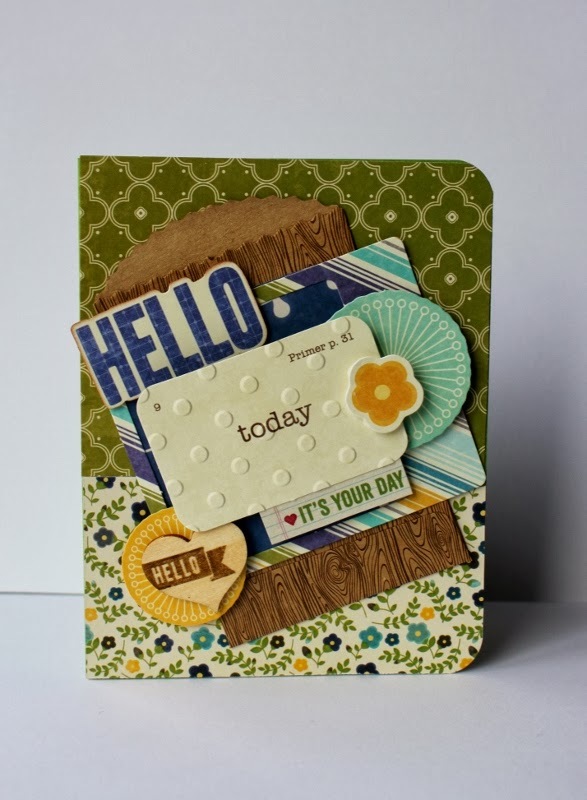 It's Leanne here today and I wanted to share a few simple tips when it comes to creating layers on cards. 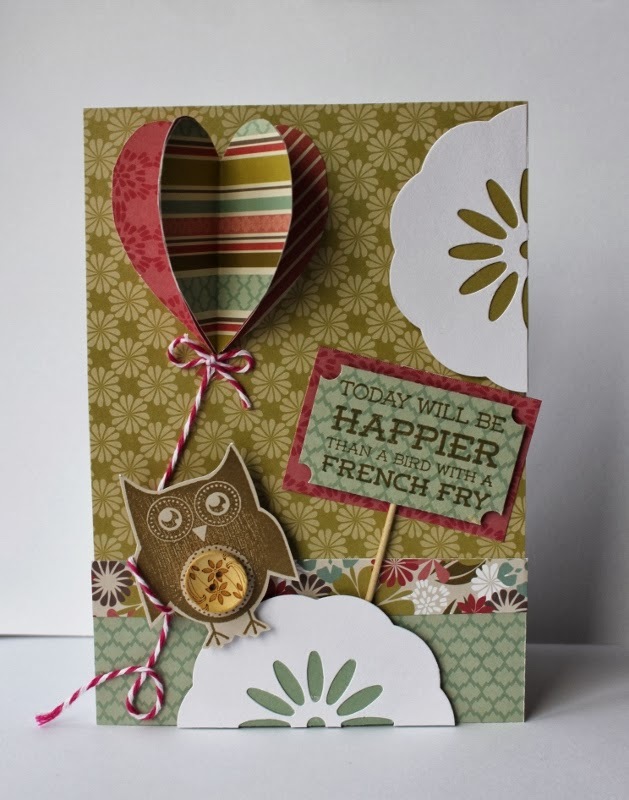 When using a busy patterned paper on smaller cards, try to find a print that has smaller images. 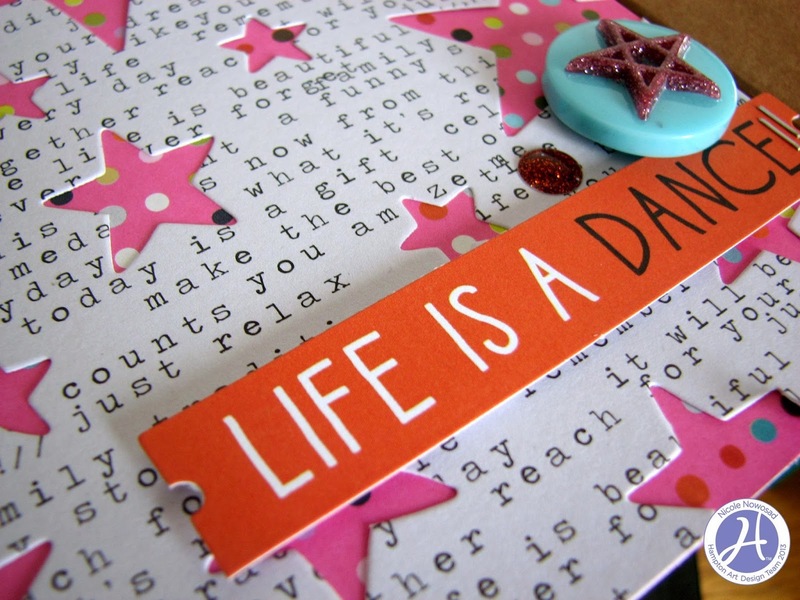 The KI Memories paper pads are ideal for creating fun and bright paper backgrounds without being too overwhelming. 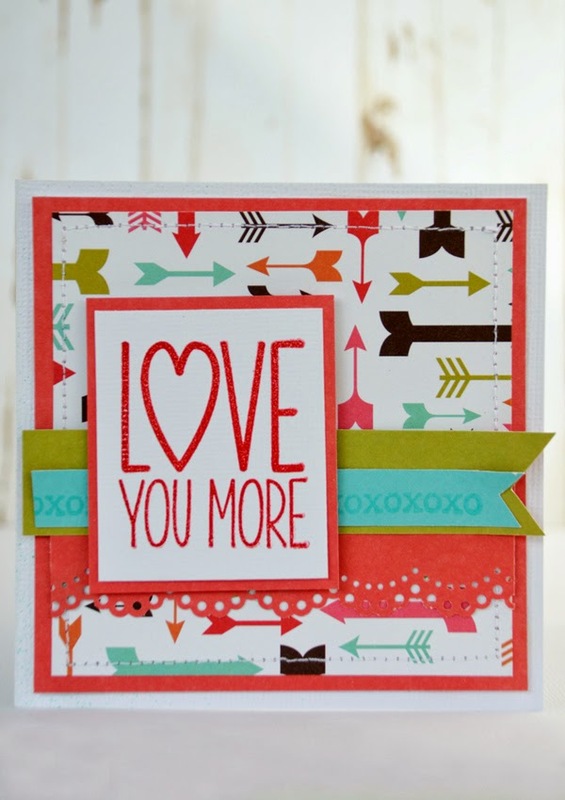 Choose a one or two base colors from the patterned paper and then create layers with the solid colors. The details on the card should also coordinate with the base colors. 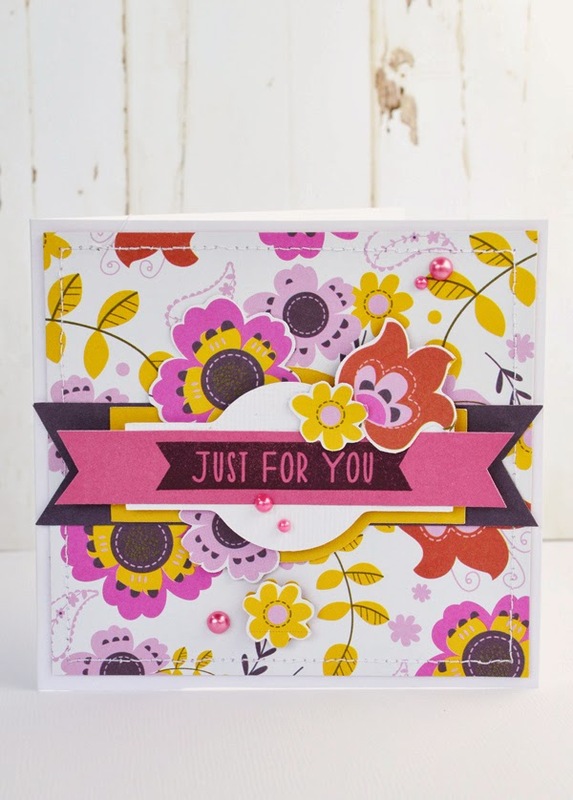 This will help achieve a cohesive and balanced look for your card. paper: KI Memories | Peace and Butterflies (KIV0407); Doilies (KIV0405). other: white cardstock, rhinestones, machine stitching, silhouette portrait. 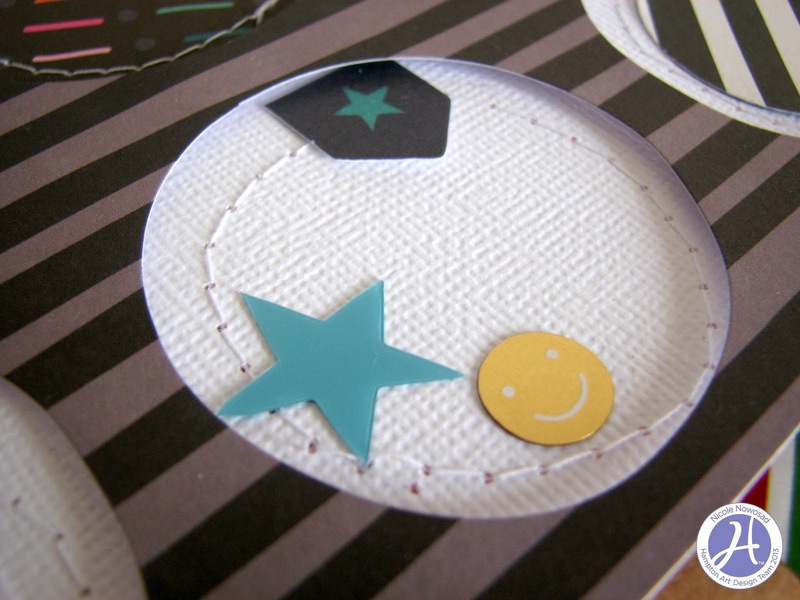 Make a feature on your card by using a simple but oversized shape. 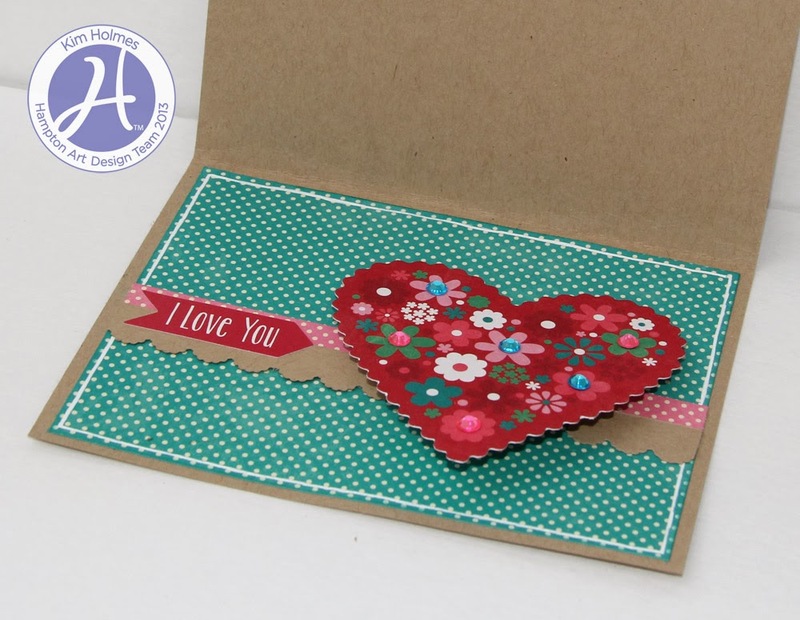 The large heart and banner creates interest on this 4"x4" card which would otherwise be a little plain! 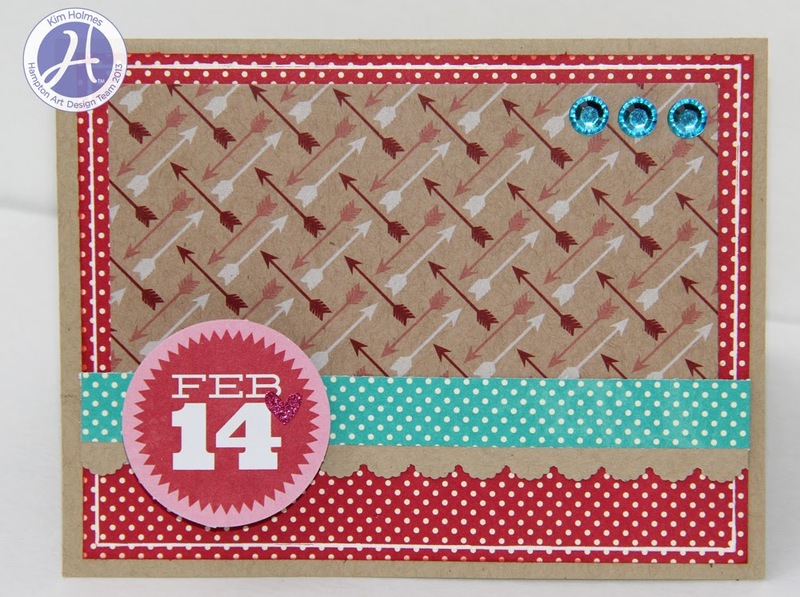 Using the Bella Blvd 'arrow' stamp helps to draw the eye towards the heart as well. stamps: Jillibean Soup | Cold Avocado Soup; Chilled Cucumber Soup. other: white cardstock, machine stitching, foam tape, border punch. Need a quick Valentine's Day card? Here is a bright and fun one created from KI Memories paper pads. 1. Trim cardstock to size and fold in half - 4"x8"
2. Using the KI Memories | Argyle paper pad, trim the reverse side of one of the patterned paper sheets for the solid color (red)- 3.75" x3.75". Adhere to cardstock. 3. Trim a coordinating patterned paper sheet (I used the arrows) to 3.5"x3.5". For added detail, machine stitch around the outside edge with white thread. Adhere to the centre of the solid color (red) creating a border. 4. From the remaining original solid color (red) punch a border strip - 3.5" in length. Overlap the patterned paper and lining up edges with the first solid color (red). 5. Choose two more coordinating solid colors to match the patterned paper and create two banners. The wide banner (green) and narrow banner (turquoise) overlap the top of the red border strip and the patterned paper. 6. Stamp the Jillibean Soup 'xoxo' image onto the turquoise banner using Colorbox | pool. 7. Stamp the Jillibean Soup | 'Love you More' image with red ink onto some white cardstock. Trim around the stamped image and adhere to the solid red color from the paper pad. Trim to leave a small border around the outside edge. Adhere to the card. Sometimes simple is better, as was the case with this Love x five card. It features one of the new stamps from the Jillibean Soup/Hampton Art – Heart Healthy Red Bean stamp set. The love sentiment does not have to be limited to Valentines day, as you can see. 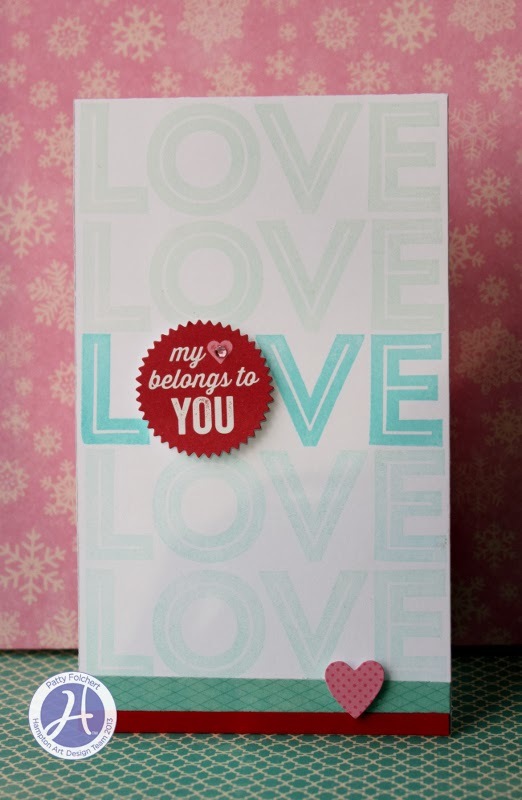 The card base is plain white cardstock trimmed to the exact size of the stamp. Then card was stamped four times in aqua ink and then once in the middle with darker turquoise ink. To further emphasize the center sentiment I added a sticker with 3D foam dots as the “o”, with a tiny pink bling gemstone on the heart. Two strips of paper were added to the bottom, red cardstock and blue diamond patterned paper. 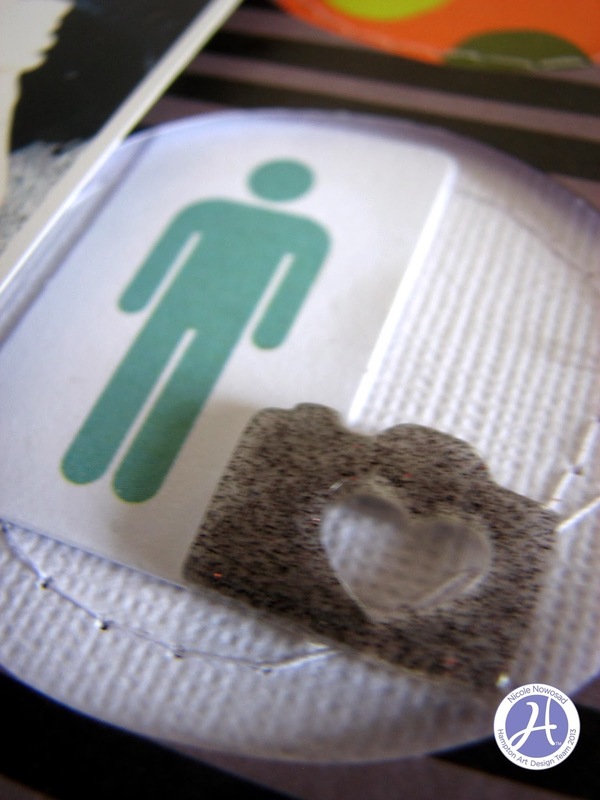 Then the heart sticker was added to bottom right as shown with another 3D dot. Who does your heart belong to? Tell them with this card and continue on with your own love story. Valentines are a special kind of mail, don’t you agree? 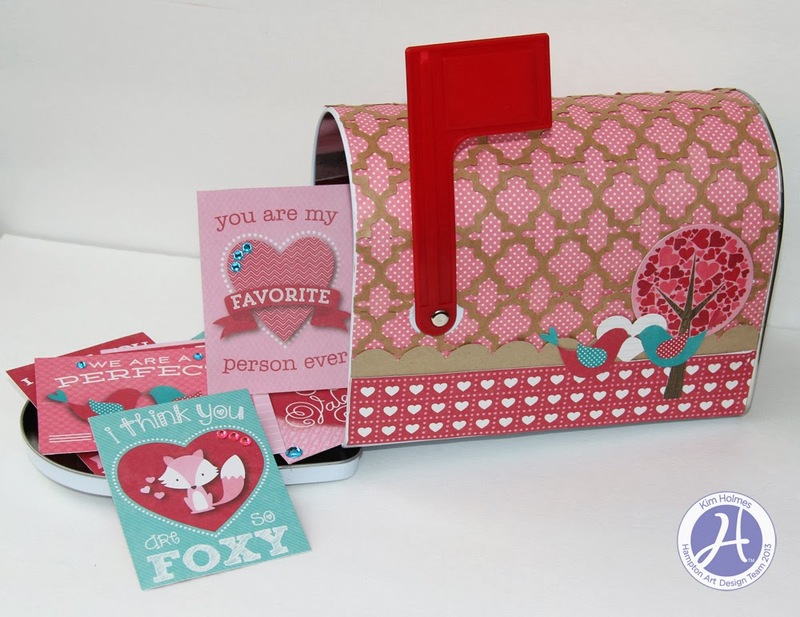 There is nothing sweeter than receiving a handmade valentine the old fashioned way, via snail mail. Here is a card your mailman will be proud to carry to it’s final destination. These stamps and paper are from the fabulous new Jillibean Soup/Hampton Art collection aptly named Heart Healthy Red Bean Soup. 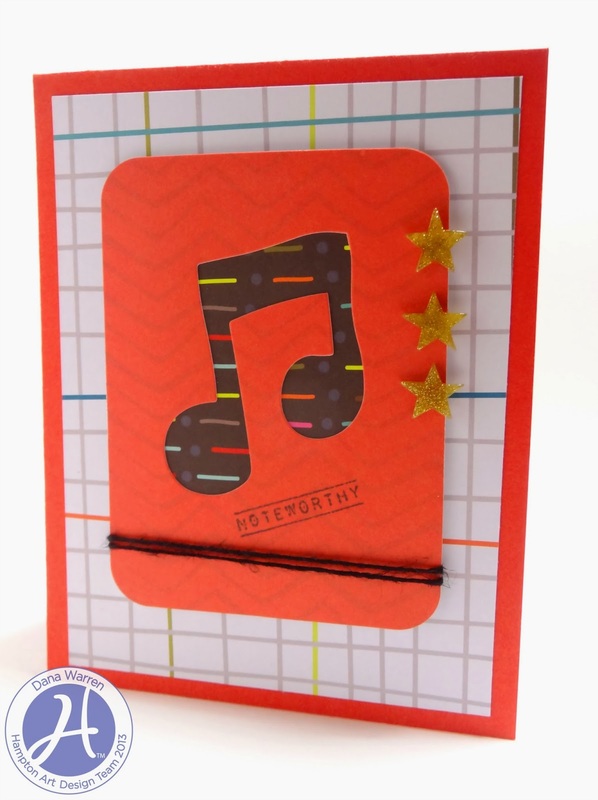 To create this card begin with a red cardstock base. From the Heart Healthy Red Bean Soup Bite Size Bits page cut out the “subway art” card and mat with pink cardstock as shown. 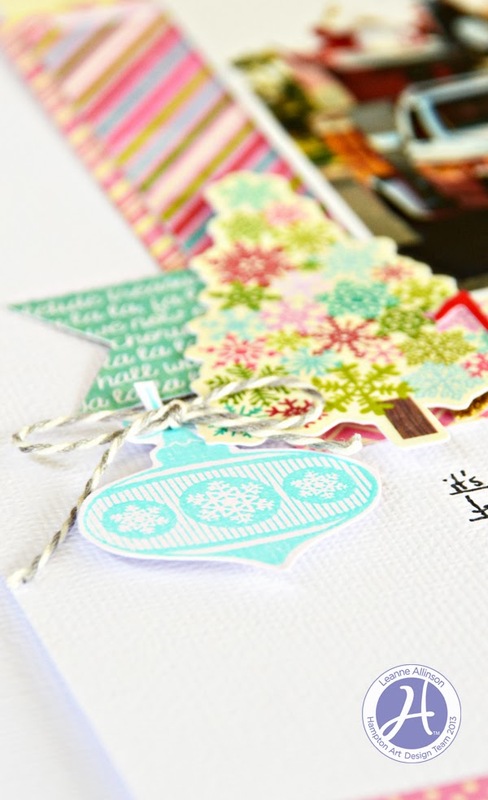 Then using a border punch add the lacy edge by punching from white cardstock. 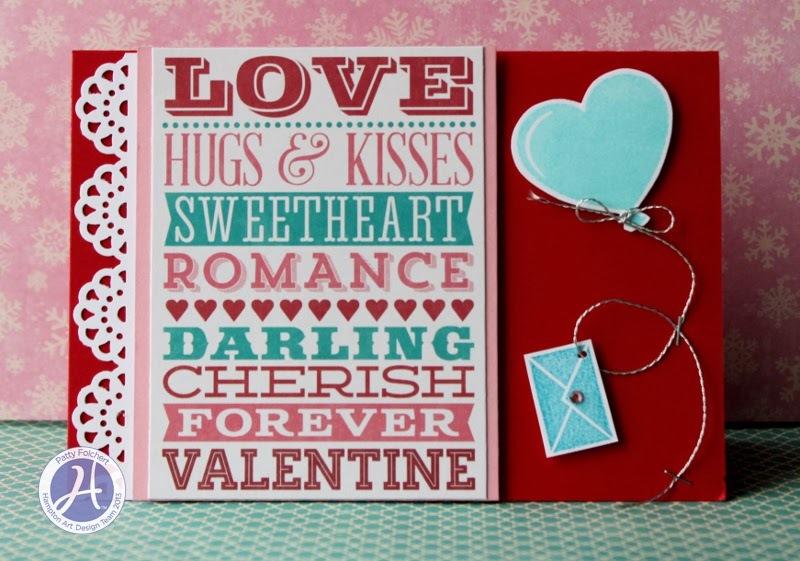 Stamp the heart ballon and envelope onto white cardstock with turquoise ink and fussy cut out. Attach balloon to card with 3D foam dots as shown. Using the smallest hole punch you have punch a hole in the top right corner of the envelope as shown, attach with foam dots. Using metallic silver string add the string tied into a bow onto the balloon and curled up and through the envelope as shown. Hold in place with tiny staples as shown. Add a tiny pink bling to seal the envelope. There it is, love delivered. 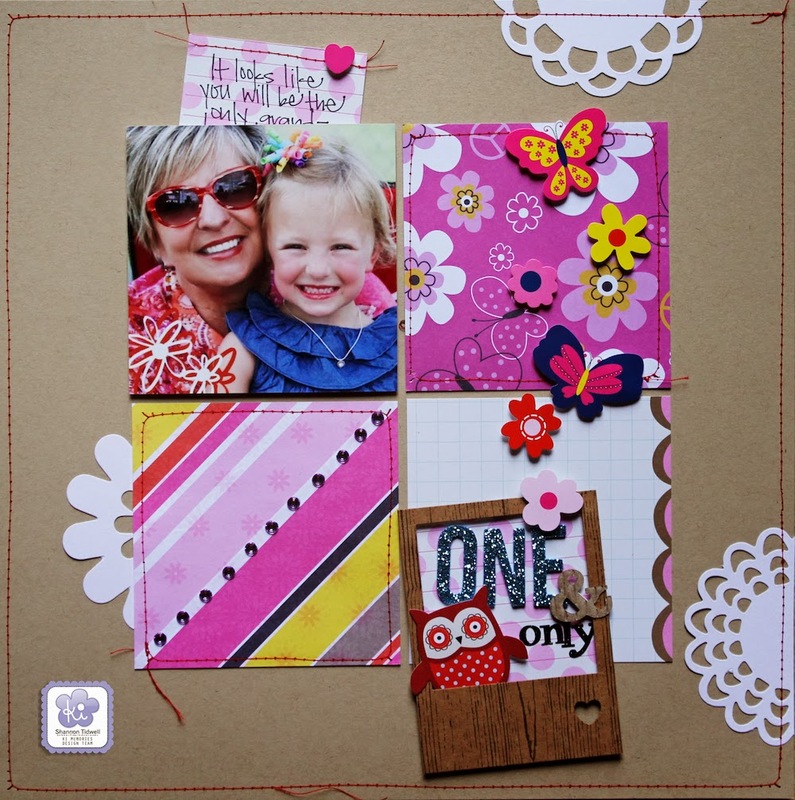 Hello everyone, Nicole here today to share a fun layout using some KI Memories papers. My whole thought process behind this page starts with wonky looking circles. I cut out some rough circles from a few different KI Memories paper packs. I cut the middle circle into a floral shape, by cutting wedges out of the circle. 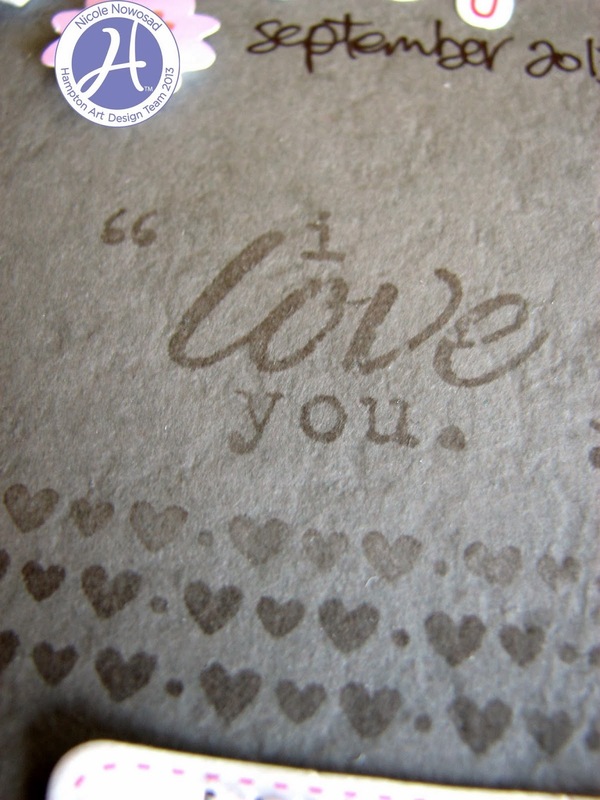 I added some stitching and then decided the page needed a little stamping, so I stamped some hearts and a sentiment from the Bella Blvd Kiss Me stamps, using gray ink onto the gray background to create a fun tone on tone effect. other: Jillibean Soup | Christmas Cheer Chowder embellishments, sequins, glitter cardstock, mist, vellum, foam tape. Are you ready to see some papers from the New KI Memories line, Playlist? If you are headed to CHA, make sure you stop by the Hampton Art booth #821 to check out the New KI Memories and so much more! NEW KI Memories - Playlist!